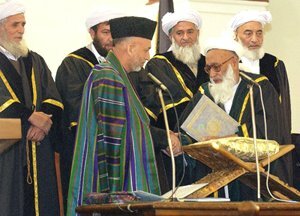 "Both Shinwari and his deputy chief justice, Abdul Malik Kamawi, have been members of Sayyaf's militia group, the Ittehad-I Islami"
KABUL, AFGHANISTAN - Since the summer of 2002, septuagenarian Fazel Hadi Shinwari has run Afghanistan's Supreme Court like the respected Islamic scholar he is. “They're just focusing on the Supreme Court, but the whole justice system is rotten," says one Afghan official privately. "Who are the nine Supreme Court justices? They're all mullahs," this official says. "If you focus on the Supreme Court, it's going to be viewed as focusing on Islam." He has banned the Afghan feminist Sima Samar from holding a cabinet position, after she reportedly said she didn't believe in Islamic sharia law. He has banned an Afghan TV station for showing what he called "half-naked singers and obscene scenes from movies." He has also spoken against coeducation; has supported the employment of women (if they wear head scarves); and ordered the arrest of an Afghan journalist who suggested that, in some cases, the Koran was open to interpretation. The charges in this case were blasphemy, punishable by death. Mr. Shinwari says these decisions are based on Islamic law. But as a growing chorus of European and Western donor nations call on the government to reform and professionalize the judicial system - as required by the Constitution and the Afghanistan Compact signed in London on Feb. 1 - the chief justice says that Afghanistan will be governed by Islamic laws or tumble into violent civil conflict. "Anything that is according to the Koran is fine with me, but if you go against the Koran, you Europeans will have to tell Karzai to get rid of this old man who is in charge of the Supreme Court," says Shinwari, a lean but sturdy man whose white turban shows his rank as a maulvi, or top religious scholar. Instability has long been President Hamid Karzai's chief concern. But when a group of European diplomats brought a démarche, or diplomatic petition, to Mr. Karzai on Feb. 11, demanding reform of the Supreme Court, insiders braced themselves for the worst. European diplomats say the démarche was merely a friendly reminder, and Afghan spokesmen say they intend to abide by promises to professionalize the court - bringing in judges, male and female, who know as much about civil law as they do religious law. But privately, some officials worry that taking on religious conservatives like Shinwari could be severely destabilizing. "They're just focusing on the Supreme Court, but the whole justice system is rotten," says one Afghan official privately. While the German government has trained tens of thousands of Afghan police, efforts to revamp the court system - led by Italy - have lagged behind, with few judges or prosecutors trained enough to know how to handle the cases that the Afghan police hand them. "Who are the nine Supreme Court justices? They're all mullahs," this official says. "If you focus on the Supreme Court, it's going to be viewed as focusing on Islam." Achieving gender balance in the judiciary is, in fact, one of the responsibilities that Karzai agreed to in the Afghanistan Compact in London. Karzai is required to present his list of justices and his list of cabinet appointees to parliament within 30 days of its regular session. "... but a woman cannot be a judge over the general country, and she cannot sit in this chair," says Shinwari, who also serves as head of Afghanistan's Council of Islamic Scholars. "If a woman becomes a top judge, then what would happen when she has a menstruation cycle once a month, and she cannot go to the mosque? Also, a woman judge cannot give an execution order, according to Islamic law." The Afghan Supreme Court is not merely the highest court of appeal. Nor is it simply the final word on constitutional issues. Supreme Court justices are responsible for managing the personnel, budgets, and policy decisions for the entire court system, down to the lowest district court. For this reason, European ambassadors say, it is important not only to rebuild the system from the ground up, but also ensure that its leadership is professionally competent. "Since Afghanistan is a sovereign country, it is not appropriate for donor nations to criticize or praise an institution," says Italian Ambassador Ettore Francesco Sequi, one of the diplomats who delivered the demarche. "The spirit of the démarche was to say, the Supreme Court is a crucial body in the implementation of the rule of law, and we attach great importance to the issue of gender, and we pledge our support and attention to its reconstruction," says Mr. Sequi. Italy spent $45 million between 2001 and 2005 on court construction and training seminars for existing judges and prosecutors. An additional $12 million is budgeted for this year, but, Sequi admits, "We should do more." But some Afghan officials worry privately that any change to the composition to the Supreme Court could upset the man who is seen as most responsible for selecting the nine current justices: former militia commander, and current parliamentarian Abdul Rab Rasool Sayyaf. Both Shinwari and his deputy chief justice, Abdul Malik Kamawi, have been members of Sayyaf's militia group, the Ittehad-I Islami, since the anti-Soviet resistance days of the 1980s. "But if you are asking, will there be women on the Supreme Court, I think that is a matter that will be decided by the president," says Jawed Luddin, Karzai's chief of staff. If Karzai calls Shinwari, the chief justice, he is likely to get an earful. "We have many women judges here, but a woman cannot be a judge over the general country, and she cannot sit in this chair," says Shinwari, who also serves as head of Afghanistan's Council of Islamic Scholars. "If a woman becomes a top judge, then what would happen when she has a menstruation cycle once a month, and she cannot go to the mosque? Also, a woman judge cannot give an execution order, according to Islamic law." Shinwari warns that forcing Afghanistan to change its Islamic traditions will cause a backlash. "When a tiger attacks a cat, and the cat is cornered, the cat will fight back," he says. "We agree with you Westerners on reform, but you cannot interfere with our religion. If you do that, people will rise up." The admission will dismay Western governments, which last week pledged $10.5 billion (£6 billion) in aid, including £505 million from Britain, to help to fight poverty, improve security and crack down on the drugs trade.